History repeats itself the new Triton 9100 ATM Machine. Designed from the ground up to be, dollar for dollar, the lowest cost ATM Machine in the industry, it features Triton's unparalleled reliability. The best low-cost ATM Machine in the industry BAR NONE. It also features Triton's own TDM - 100 dispensing mechanism, incorporating state-of-the-art electronics and a host of features like locking casette and automatic error recovery designed to maximize uptime. Customizable to suit the needs of each location, the 9700 series builds on Triton's renowned reliability and over all low cost of ownership to deliver the most cost-effective ATM Machine in its class. Developed specifically for the traffic and transaction volumes that characterize many retail, food service, and hospitality locations, the Triton 9700 offers a full range of options that can be configured to suit the functional and economic requirements of any retail business. The 9700 is compliant with existing and proposed ADA regulations. An optional audio port, a shorter cabinet, a brighter LCD transaction screen with a wider viewing angle and redesigned keyboard, make it easy to use. 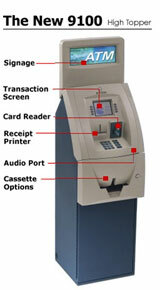 Loaded with modular options, the Triton 9700 ATM Machine is the new standard for ATM Machines. A cost-efficient, 24-hour through-the-wall ATM Machine designed with the merchant in mind! The extremely reliable and affordable Triton RT2000 ATM machine gives merchants a low-cost, easy to service, 24-hour alternative to more expensive through-the-wall ATM machines. 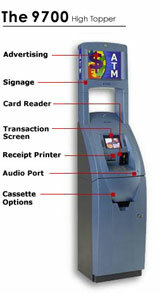 The Triton RT2000 ATM machine is easy to install and easy to maintain. Its high performance is partly due to the custom-engineered dispensing mechanisms. Triton's self-calibrating dispensing mechanisms are designed to dispense 250,000 notes with no preventive maintenance. And most of all, its low cost and reliability mean your high traffic ATM location can finally become a high-profit ATM location. It's simply the most cost competitive PC-based ATM Machine in the market! Based on the powerful and reliable new Windows® Intel® XScale™ PC platform, the Triton RL5000 ATM machine offers remarkable functionality at a much lower price point than other PC-based ATM machines. Plus the RL5000 offers ADA compliance, an Encrypting Pin Pad (EPP), Triple DES compliance, and a surprisingly small footprint. There's simply not another PC-based ATM machine on the market that offers this level of performance and cost-competitiveness. 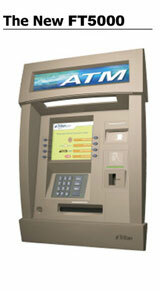 Introducing Triton�s all-new RL2000, the latest and greatest low-cost ATM for retail locations. With the widest range of dispensing mechanisms we�ve ever offered, it�s the ideal choice for everyone from small c-stores and restaurateurs, to major hotel and retail chains. The 8100 is our lowest cost ATM designed for merchants with low-traffic, tended locations who are over served by bigger, more expensive ATMs. Triton's long-time experience with cost-conscious banks and credit unions led them to develop this model designed with the financial industry in mind. With an Encrypting PIN Pad (EPP), rear access, and full ADA and Triple DES compliance, the PC-platform FT5000 also supports a variety of communication protocols. But what makes the Triton FT5000 ATM Machine most attractive to banks and credit unions is its highly cost-effective operation. Plus, the Microsoft® CE Windows® operating system makes possible a long list of revenue generating value-added services. 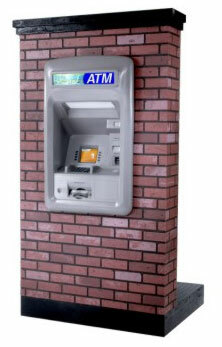 Now thanks to Triton, there's a through-the-wall ATM built just for you. The Triton 9800 ATM Machine will redefine the PC-based ATM market by combining the flexibility of a PC-based ATM with the Triton mission to provide the most cost-effective ATMs in the market. The 12.1" high brightness LCD combined with the Windows® 2000 operating system gives you complete control over the transaction screen. Your in-store messages, advertisements, and branding can be created as easily as you can create them on your own PC. Plus, with the Windows® system, you can print any font or style on the printer in landscape or portrait. The 9800 is ADA compliant with existing and proposed regulations, features various mechanism options and offers additional revenue generating opportunities such as full-motion video advertising or side car options. Finally, an adaptive, full service with the flexible on-site management tools you need at a price you can afford. Introducing the ATM of the future. 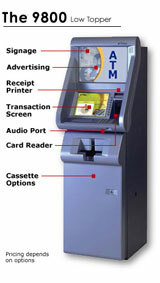 For over 30 years, Triton ATMs have set the standard in innovative cash-dispensing solutions. ARGO, our newest line of ATMs, is no exception. ARGO features an updated, next-generation design with added elements of security, larger screens, and easier-to-read keypads or touchscreen options. For the first time in industry history, models are now available in an eco-friendly, printer-less model, reducing each machine�s carbon footprint and resulting in cost savings over the life of the machine.